A series of concerts that are both live performances and public sound research focused on the natural frequencies of the Old Church of Amsterdam, the oldest building of the city. The first concert in the summer series is both a concert and public sound research, by Zeno van den Broek. Acoustic tests focused on finding the natural frequencies of the Oude Kerk will have been executed in the week before and will be translated into a live performance. Zeno van den Broek will base his work on a method made famous by Alvin Lucier with his composition I Am Sitting In a Room(1969), in which Lucier performed and recorded a text, played it back, recording it again and again, until it was abstracted by the natural frequencies of the room. This ‘Lucier-method’ will be used in the Oude Kerk, to find the natural frequencies of the church building. Instead of text, Zeno van den Broek will use the sounds that are inseparable from the church: the transept-organ and amplified bells. The performance will start of with a four minute composition for organ and bells by Van den Broek which will be re-recorded and re-amplified in the church. This proces results in these natural sounds to evolve during the passing of this morning event into more and more abstract resonances, in tune with the architecture of the church. The concert on 3rd of August consists of an electronic composition by BJ Nilsen and sound artist Zeno van den Broek. 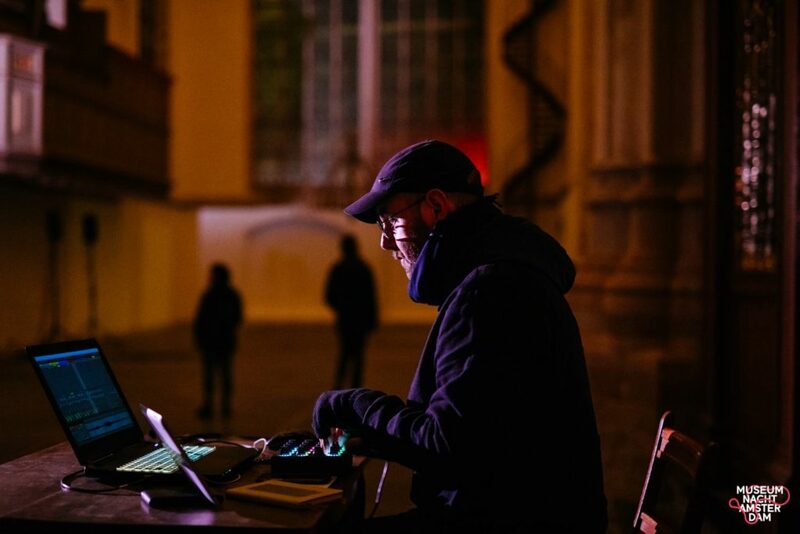 During the previous silence concert on the 1 June, van den Broek used the ‘Lucier-method’ to find the natural frequencies of the church building. During the performance van den broek used the sounds that are inseparable from the church: the transept-organ and amplified bells. A composition of 4 minutes was performed, recorded, played back while recorded again, played back and again. The performance resulted into more and more abstract resonances, in tune with the architecture of the church. Together with the Swedish composer and sound artist, BJ Nilsen, Zeno van den Broek is working on a new composition in which the sound of the church bells are amplified. With this sound the spaces inside and outside the church will merge together. During the Museumnight of Amsterdam on 3rd of November Zeno van den Broek expanded the method used during his two concerts during the Silence series with a large scale setup of microphones and speakers enveloping the whole church. During the night four concerts took place, each based on different composition for organ and church bells, exploring different acoustic aspects and characteristics of the Old Church. In the early morning the Oude Kerk is a meditative oasis in the city, with an enervating sunrise coming through the high church windows. At this early hour you can enjoy the Silence music programme, a contemplative counterpoint to a hectic city centre. In conjunction with Giorgio Andreotta Calò, the Oude Kerk has planned a new series of concerts in the Silence series, every first Friday of the month, from June to September. With the red-filtered daylight in the Oude Kerk, Giorgio Andreotta Calò makes a statement with a simple intervention. By creating a red veil of light, his new work Anastasis refers to a history divided into two halves: the warm colourful atmosphere of the Catholic era of the Oude Kerk, opposed to the visual emptiness after the act of Calvinist iconoclasm in 1566. All elements used in the Silence concerts during the exhibition Anastasis will be connected to the church space itself: organs, bells, and the choir music of Sweelinck. The bells’ history reflects a history of iconoclasm and Reformation, too. After the Reformation, one bell was destroyed, like most of the art in the church. The others lost their Catholic names, and were recast in 1659 with Protestant inscriptions. The abstract image created by Giorgio Andreotta Calò also makes the visitor think about light frequencies: the behaviour of light in space. A simple next question is: What is the ‘sound colour’ of the Oude Kerk? What are the natural frequencies of this vast church space? The first concert of 1 June, by Zeno van den Broek, deals with these questions. The results of a ‘concert-by-research’ will be used in the following concerts during the summer: on 6 July choir music by Jan Pieterszoon Sweelinck, on 3 August an electronic music concert by sound artists/composers B.J. Nilsen and Zeno van den Broek, and on 7 September a concert with organ, bells and electronics.